A region devoid of magnetic field, or diamagnetic cavity, discovered by Rosetta at Comet 67P/Churyumov–Gerasimenko. The magnetic field-free region, shown here in blue, is caused by the interaction of the comet and the solar wind, shown in purple. The solar wind is a flow of electrically charged particles streaming from the Sun (located beyond the left edge of the image) and carrying its magnetic field across the Solar System. When it approaches the comet, which is pouring lots of gas into space, its flow is obstructed and slowed. Eventually, the solar wind stops entirely, diverting its flow around the comet, and also its magnetic field is unable to penetrate the environment around the comet, creating a region devoid of magnetic field called a diamagnetic cavity. 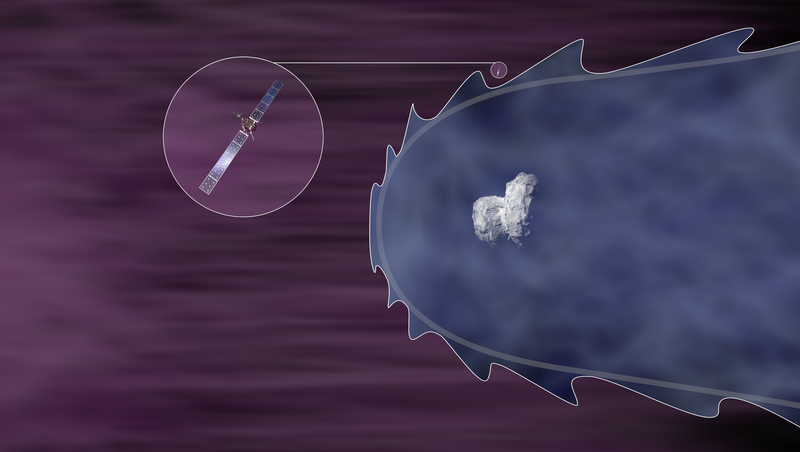 Scientists expected that such a diamagnetic cavity could form at Rosetta’s comet around perihelion, but only extend to 50–100 km from the nucleus, and since the spacecraft was at greater distances from the comet at the time, they did not expect to detect it. Instead, they measured almost 700 magnetic field-free regions with the RPC-MAG magnetometer on Rosetta since June 2015, revealing that the cavity is much bigger than expected. The reason for that is likely an oscillating perturbation, or instability (thin wiggly line), that propagates and gets amplified along the boundary (thick line) between the solar wind and the magnetic field-free cavity, causing the latter to grow in size and allowing Rosetta to detect it.